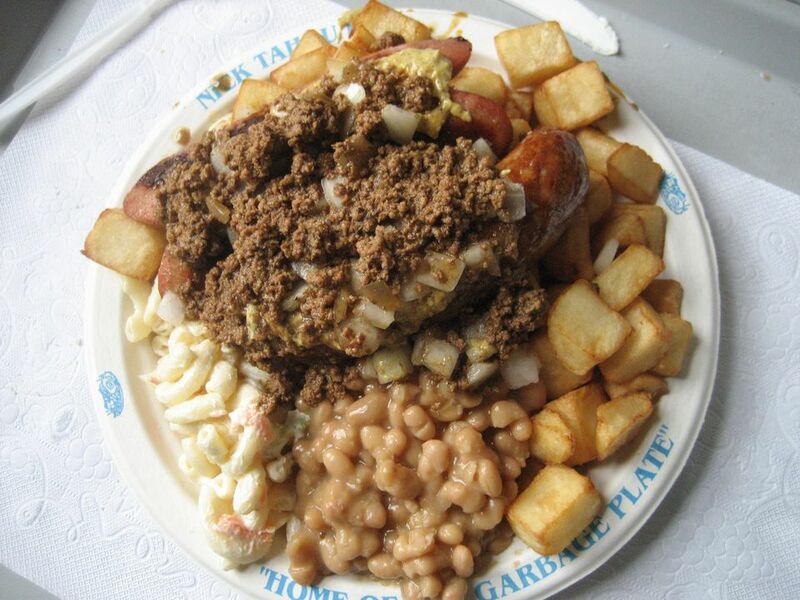 The garbage plate is an example of American extreme cuisine. It was born in Rochester, New York, at Nick Tahou Hots, a landmark restaurant famous for this classic regional specialty. The earliest version goes all the way back to 1918 when it was originally called "Hots and Potatoes." The regular customers called it by the nickname "Hots and Po-tots," and it was basically a plate piled high with fried potatoes, baked beans, hot dogs, onions, mustard, and a chili-like meat sauce. It wasn't until many years later that the dish was officially renamed the "Garbage Plate." The restaurant and bar had become very popular with Rochester's large community of college students, who upon seeing this huge plate of food, and not knowing what exactly it was called on the menu, would simply ask the waitresses, "can I get one of those plates with all the garbage on it?" The name stuck and the tradition has continued through the years. In 1992, the "garbage plate" name was trademarked by Nick Tahou Hots. After that, local Rochester restaurants were restricted from calling their versions "garbage plates." Now, each establishment uses their own particular blend of ingredients to create their own version. Depending on where you go, it may be called a "trash plate," "messy plate," or a "dumpster plate" instead. Today, this bizarre dish is a popular item all over the Rochester area and can be found at many local restaurants. In recent years, the cheeseburger has replaced the hot dog as the most popular type of garbage plate. Custom dictates you get your choice of two base items, from a list that includes home fries, pasta salad, baked beans, mac and cheese, French fries, and other similar food items. After the starchy foundation is formed, it's topped with either grilled red hots, cheeseburgers, eggs, fish, or whatever else the restaurant you happen to be at offers. Then, finally, the plate is topped with the meat sauce, onions, and bright yellow mustard. As if that wasn't enough, the modern garbage plate is often served with a soft roll or a few slices of white bread to sop up all the liquid. Rochester is a college town and the garbage plate is often thought of as a great late night snack (or meal) for college students. Nich Tahou's gets very crowded with a late-night crowd, and many consider eating a garbage plate local rite of passage. The popularity of this restaurant among the college crowd has even sparked a local charity event. The University of Rochester's Sigma Phi Epsilon fraternity holds an annual Nick Tahou's Run. The charity event benefits the local Mount Hope Family Center, which receives all proceeds collected during the event, including the sponsor funds and all the runner's entry fees. This race is held every year in the spring, with a three-man team. The race begins at the University of Rochester campus. The three-member team runs 2.2 miles through Rochester to Nick Tahou's. When the team arrives at the restaurant, the second teammate must eat a garbage plate as quickly as possible. The third teammate runs back to campus to finish the race. In a race variation known locally as the "Ironman," one person attempts to complete both running legs of the race and the eating alone. If you are considering making this unusual dish at home, you will want to follow the step by step instructions. Since the dish can vary from restaurant to restaurant, there is no exact recipe for creating your own garbage plate. An at-home version will likely work best using leftover food from a big event. If you have leftover pasta salad, baked beans, macaroni and cheese, or other similar items, simply pile them on a plate, and top them with a protein like a burger or hot dog, and then top that off with meat sauce, onions, and mustard. Enjoy the homemade version (if you can) and make sure to have some heartburn medicine on hand just in case. Rochester, New York's Famous "Garbage Plate"